Scottish Episcopal Church News for February 2015 - What is in Kelvin's Head? 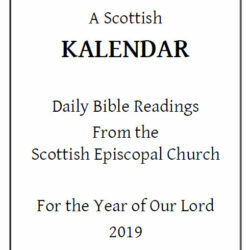 A new online resource has been made available by The Gaelic Society of the Scottish Episcopal Church. It consists of a parallel English-Gaelic text of the 1982 liturgy and sound recordings to help Gaelic learners. The texts and recordings can be found on the website of the Diocese of Argyll and The Isles. The Rev Liz Baker was instituted as the Rector of the Highland Perthshire Group in Pitlochry. The Very Rev Richard Kilgour resigned from being the Provost of St Andrew’s Cathedral in Aberdeen in December. The Rev Dr Richard Hines has been appointed to St James the Less, Holburn Junction, Aberdeen, moving there from being Vicar of Christ Church, Stanley in the Falkland Islands. Ivor Guild was in the long line of distinguished Scottish lawyers who have given devoted service to the Scottish Episcopal Church. He was a faithful and devoted communicant member of St Paul’s Cathedral, Dundee, where he was brought up, and then for the rest of his life “an eight o’clock man” at St Mary’s Cathedral, Edinburgh. Despite holding a number of high profile public offices – Procurator Fiscal of the Lyon Court; Bailie of the Palace of Holyrood House and Chairman of the National Museum of Antiquities of Scotland amongst them – he was essentially a very private person. At the end of last year a mural was painted outside St John’s Church in Edinburgh. Like many of the previous murals, this one was controversial enough to cause some considerable comment. (A typical example of the outrage being on “Archbishop Cranmer”‘s blog. The Rector of St John’s, the Rev Markus Dünzkofer has now published a reflection about the various murals that have occupied the spot. Thirty years ago the murals were created as a response to this prophetic tradition. Not unlike Hosea and Nathan they are at times rather uncomfortable and at other times really affirming. Most of the times they are somewhere in between. And sometimes they miss the target. It all depends on the subject matter and on one’s particular viewpoint. But all the time the murals strive to set a question mark amongst the indifference and the fears of our world. And at times these question marks have to be most powerful. This is why the murals are appreciated by many. The College of Bishops has responded to a letter of concern from over 50 clergy and lay readers in response to guidelines regarding changed to marriage law published by the College in December 2014. Bishop David has been to the 20th Anniversary of Scottish Churches Housing Action. Ruth Innes has some book recommendations. John McLuckie says Happy Birthday, Thomas Merton. Pip Blackledge has been thinking asking what the limits of free speech are in Humour and Terrorism. Christine McIntosh has been Snuffing out the Candles. Kelvin Holdsworth thinks the Church of England has taken one step forward and two giant leaps back. Alison Clark remembers Mary Slessor. Thank goodness for a decent update! The bishop’s response is very welcome, if only for its complete change of tone. However, as an all-too-typical member of the LGBT community, I do not think that ir goes far enough, The attitudes expressed in the bishop’s original letter were, quite apart from the bits of archaic doctrine, expressed in a demeaning and homophobic manner, and the doctrine itself is not open to justification by any reasonable scriptural interpretation. When expressed at the higher echelons of our society, homophobia can have a terribly pervading influence, for example on friendships, family relationships, and attitudes by employers towards LGBT employees. The crass homophobia expressed over the years by the Roman Cathoiic Church has doubtlessly caused by ripple effect, lots of discrimination, and even violence in the streets towards gay people, I think that the bishops should more explicitly apologize for their crass homophobia, and retract their original document. I guess that I may be representing the views of many of my friends in the LGBT community, believers and non-believers alike, when I respectfully call upon the bishops to proffer their apologies forthwith. Would somebody like to respond to my previous comment? Where are the brave?